With the ever-rising technological advancements to leverage solar energy in the modern era, maintaining the optimum performance of such energy devices like solar cell panels for PV applications and mirrors used in CSP (solar thermal energy generation) has become an important issue. Under actual conditions, the effective efficiency of such solar cell panels may be significantly reduced due to deposition of particulate and organic contaminant on the solar glass covers, as dirty solar panels do not produce as much power as clean PV panels. The dust fouling has an extremely detrimental effect on PV panels, and it varies depending on the area and its environmental conditions. In dry and scant rainfall areas like Saudi Arabia, loss in solar PV panel efficiency may range as high as 26-40%, and the transmission of glass cover on PV panels reduced to 70% because of dust in summer. As a result, self-cleaning surfaces have drawn much attention around the world both in scientific research communities and in the sector of commercial applications like automotive, building, as well as optical, biomedical, and household devices. The most practical solution of this problem is applying self-cleaning coatings based on their ability to make the surfaces either hydrophobic, hydrophilic, or photocatalytic. 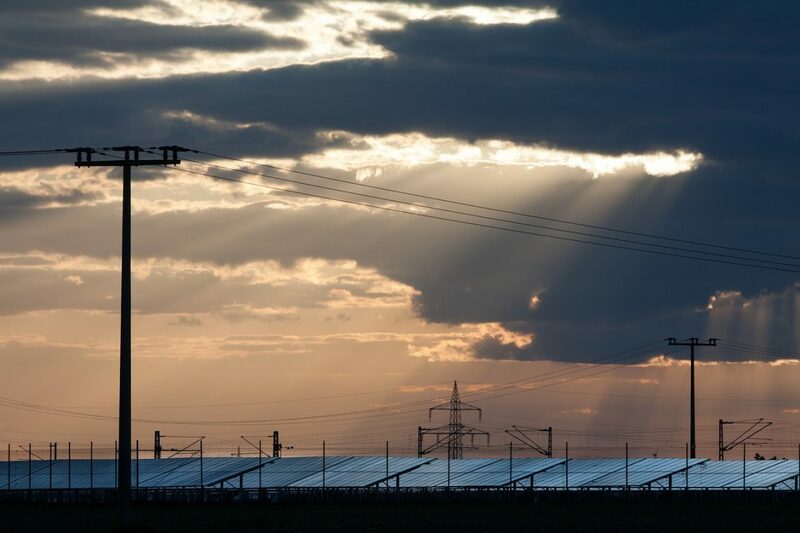 In order to make such coatings compatible for use on solar panels for a long duration, the coatings are designed to have specific properties that are fundamentally important, such as substantial optical transparency (92% or more), adequate abrasion/scratch resistance, and the desired contact angle. Self-cleaning coatings exhibiting either super-hydrophilic or super-hydrophobic behavior are being deployed commercially for PV module industries all over the world. It should be noted that both the hydrophobic and hydrophilic coating have their own merits and demerits. However, in many cases, self-cleaning super-hydrophilic coatings have been found to outperform superhydrophobic coatings at both the lab and industrial environment. All the same, many recipes for durable superhydrophobic coatings have also been developed, patented, and licensed. Coatings with photocatalytic properties absorb light (UV-Vis) that in turn causes dirt or other foreign particles on the surface to slowly loosen or break down via oxidation. Also, by virtue of its super-hydrophilicity, water seeps under fouling and carries it away from the surface due to the designed inclination in the setting of PV panels. Most of the super-hydrophilic coating is found to consist of TiO2, a photocatalyst capable of breaking down organic contaminant when exposed to light. TiO2 thin films are well known for their excellent photocatalytic activity, substantial mechanical hardness, and light induces super-hydrophilicity. However, due to the wide energy band gap of TiO2, it fails to absorb visible light, thereby making its application limited to the UV region of solar irradiation. Our very first work involves V-TiO2:SiO2 coatings, simultaneously exhibiting antireflecting, self-cleaning properties (“i.e.” super-hydrophilicity) and photocatalytic activity under visible light irradiation . Also, in this case, the effect of O2 plasma in altering the wetting property of such coatings has been demonstrated. On O2 plasma treatment, the contact angle of all the coating formulations that have been investigated in this study decreases to 0°, irrespective of their composition. In one of our R &D works, we have developed a unique technique to create porous TiO2 thin films with a highly ordered colloidal array using block copolymer assisted evaporation-induced self-assembly (EISA) method. The method adopted by us makes use of high molecular weight triblock copolymer Pluronic F127 in combination with TiO2 sol to develop thin film coating of TiO2 on a glass substrate with the help of dip-coating technique. The detailed experimental procedure and findings can be found in one of our recent publication . The initial results of this work have also been presented at an international conference . With the advancement of soft nanotechnology, the formation of a variety of nanostructures and its enormous implications in creating materials with new mechanical, optical, or electronic properties as well as specific functionality proliferated over past few decades. Soft nanotechnology integrates polymer based soft materials and hard inorganic material using a unique technique of molecular self-assembly to create surfaces with regular pattern without using a sophisticated lithographic technique. The technique of colloidal self-assembly to create a patterned surface of inorganic metal oxides such as SiO2 and TiO2 found widespread applicability in the field of optical filters, photonic crystals, nanostructured antireflecting coating, and several other several other silicon-based devices. 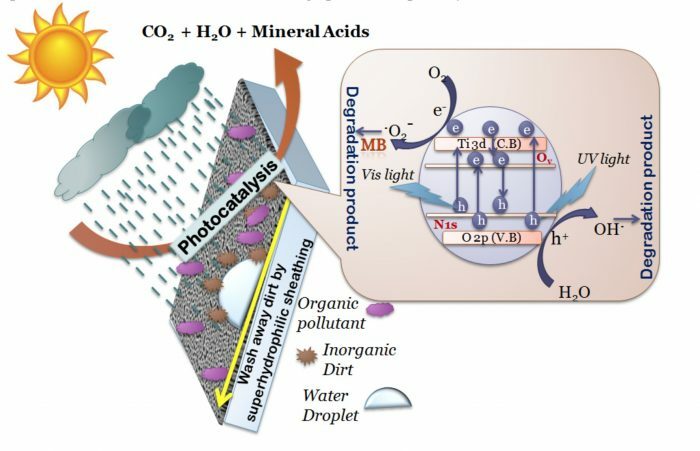 In order to make TiO2 photoactive in the visible region of the solar spectrum, we have doped TiO2 with N atoms using by a plasma-assisted technique in a modified RF (13.56 MHz) sputtering system using ultra-high purified N2 gas as a precursor at room temperature. The plasma treatment for 2.50 min at 55 W with a self-bias potential of 485 V has proved to be the best-optimized condition. The N plasma treatment reduced the band-gap energy of TiO2 films to 2.94 eV from 3.0 eV extending the photocatalytic activity up to 421.7 nm of the solar spectrum. The detailed schematic of the self-cleaning activity of single component N doped porous TiO2 coating has been given in the journal, depicted in Figure 1. The self-cleaning activity of N doped TiO2 coatings are investigated by studying photocatalytic degradation of MB on the surface of coating in presence of solar light. Also, coatings are found to be super-hydrophilic with water contact angle < 5°. The transmission of the coating over soda-lime glass slides was found to be > 94% in the visible region of the solar spectrum. Thus porous TiO2 coatings enhance the transmission of the bare glass substrate by about 4%. To investigate the reason behind such behavior of the coatings spectroscopic ellipsometry and X-ray reflectivity study was performed. A substantial porosity ~ 80% was confirmed by both these studies. The refractive index obtained was also found to be comparatively low value (1.3) compared to TiO2 thin films reported in published literature. To validate the real-life application of such coating in an outdoor application, mechanical properties of such coatings were performed using a pencil hardness tester and nanoindentation technique both. The coatings are found to be robust with microhardness ~ 2.02 GPa. Also using the pencil hardness tester, hardness value more than 3H is obtained, which is required for practical applications. Further, to check adhesion strength of the coatings, the silica coated glass substrate was kept in 5% saline water and boiled for over 60 min. Since no peeling/delamination or change was observed in the optical transmission or contact angel values before and after performing such experiments, it can be said that the coating can sustain the outdoor environment. By adjusting sol composition, withdrawal speed during dip coating and post-deposition heat treatment etc it has been possible to reach past 5H hardness value while maintaining transparency of about 92%. Finally, Sol-gel based antireflecting coatings with tunable wettability for photovoltaic solar glass covers, which in certain cases show superhydrophobic behavior have also been experimented by our group (Figure 2). A single component mixed silica sol, prepared by varying composition of silicate precursor, catalyst, and silane functionalization was prepared and coated on glass substrates. The dip coating withdrawal speed has been optimized carefully. 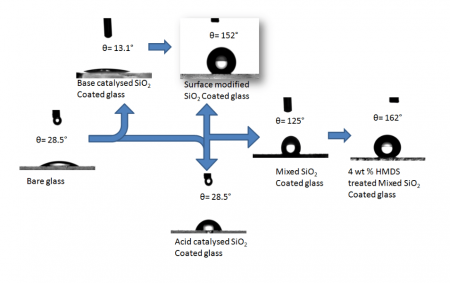 A single-layer ORMOSIL (organically modified silicate) thin film coating has been prepared on a glass substrate which has potential application as a self-cleaning coating on solar glass covers. At CEGESS-IIEST Development of Electrodynamic Screens for Solar panels, to be used in locations where there is very low humidly in the atmosphere and no readily available water resource is also being pursued. These findings are described in the article entitled Non lithographic block copolymer directed self-assembled and plasma treated self-cleaning transparent coating for photovoltaic modules and other solar energy devices, recently published in the journal Solar Energy Materials and Solar Cells. In this R & D work reported following individuals contributed, Deepanjana Adak, Sugato Ghosh, Anup Mondal, Prof. Hiranmay Saha, Dr. Raghunath Bhattacharyya from IIEST-Shibpur and Poulomi Chakrabarty & Prof. Rabibrata Mukherjee from IIT, Kharagpur, as also Dr. K.M.K Srivasta from NPL, New Delhi. Adak, D., et al., Self-cleaning V-TiO2: SiO2 thin-film coatings with enhanced transmission for solar glass cover and related applications. Solar Energy, 2017. 155: p. 410-418. Adak, D., et al., Non lithographic block copolymer directed self-assembled and plasma treated self-cleaning transparent coating for photovoltaic modules and other solar energy devices. Solar Energy Materials and Solar Cells, 2018. 188: p. 127-139. Deepanjana is a junior research fellow at the Indian Institute of Engineering Science and Technology, CEGESS. Research interests include transparent self-cleaning coating; sol-gel coating; plasma deposition; aerosol spray coating; transparent superhydrophobic coating; photoinduced superhydrophilic coating; antireflection coating; application on PV glass cover, optical device, architectural glass material.